Energy is considered as basic pillar not only in fulfilling the demands of human needs but also to control economic growth of any country. Pakistan has been facing severe energy crisis since 2007, which results in devastating impact on industrial growth and ultimately increase in the rate of unemployment. To address this issue, “International Symposium on Advanced Energy Materials: Production to Storage (ISAEM 2018)” was successfully organized by Interdisciplinary Research Centre in Biomedical Materials (IRCBM) at COMSATS University Islamabad (CUI), Lahore Campus. 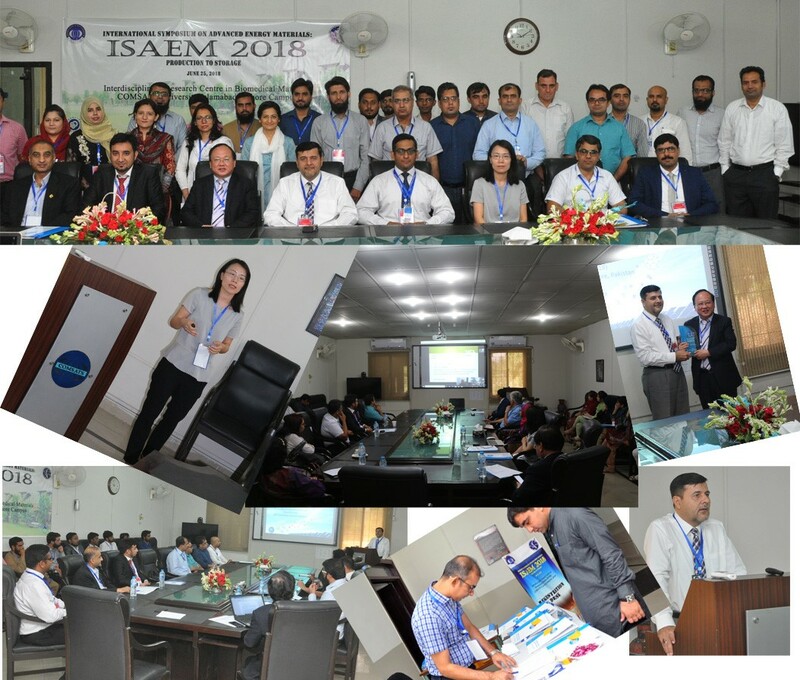 ISAEM 2018 was funded by Pakistan Science Foundation and National Natural Science Foundation, China through a collaborative project between Pakistan and China. ISAEM 2018 aimed to bring together academics and researchers from within and outside of Pakistan to discuss latest progress and development in energy production and its storage. International and National keynote speakers participated and highlighted the best possible solutions to overcome energy crises. Additionally, they also focused that the present reliance on fossil fuels including oil, gas and coal should be reduced due to their adverse effects on environment. They emphasized on the development and designing of (i) new renewable/alternative clean energy resources e.g. biomass, solar, wind etc. and (ii) new functional materials to harvest sunlight and convert it to energy through, hydrogen evolution from water splitting, dye sensitized solar cells and biofuels from plastic waste decomposition. In addition to the energy production, energy storage is equally important. Prof. Jawwad A. Darr from University College London discussed the future of energy storage and role of nanomaterials in the improvement of efficiency and lifetime of energy storage devices. Director CUI, Lahore Campus, Prof. Qaisar Abbas had a successful meeting with the delegates from China Prof. Jinlong Zhang and Prof. Lingzhi Wang and discussed the ways for the further strengthening collaboration between CUI, Lahore Campus and East China University of Science and Technology, Shanghai. They also discussed the feasibility of establishing a joint Advanced Materials Lab in IRCBM, CUI Lahore Campus. Here, are some of the highlights of the ISAEM 2018.